Michelle first reached out to us in March of 2012 when Tally (her beloved senior beagle mix) was diagnosed with Perianal gland carcinoma, IBD, bouts of pancreatitis and some seasonal allergies. Prior to Susan designing this diet, Tally had frequent bouts of diarrhea, vomiting and pancreatitis. He was on 5mg of Prednisone every 2-3 days. After I began the diet, he NEVER had diarrhea, vomiting or pancreatitis again, and he was able to be taken off the Prednisone completely within 2-weeks of starting the diet. WHAT A MIRACLE!! Just to let you know my 13-1/2 year old dog, Tally was at the vet today and his ALT level is normal. Thank you for recommending Lypozyme, and thank you for recommending the diet he has been on for over 2-years. I tell everybody about you! Susan Blake Davis and the Ask Ariel staff are just incredible. I remember when I was so apprehensive of the diet and supplements because I tried so many different things throughout my dog's life. I was totally astonished when Tally came off prednisone in just a few weeks using her program, and my vet was even amazed. 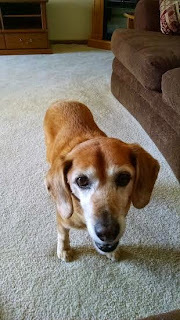 I recommended Ask Ariel to a friend who had a dog with a huge liver tumor and was told by her vet that she would probably need to be put down within a few weeks. With the help of Ask Ariel, that dog could go for walks again and had a good quality of life for an additional 1-1/2 years. Tally is almost 15 years old and he would never have lived this long if it were not for Susan Blake and Ask Ariel products.